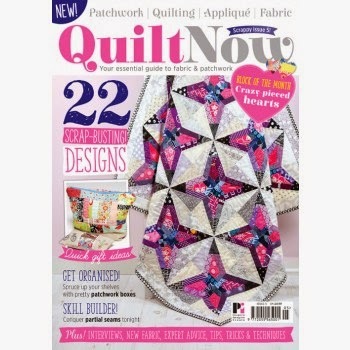 Today I want to share with you the first of 3 quilts that I have out right now in different magazines. I swear, I didn’t intend to triple stack the end of the year like this…all the quilts just happened to have the same publication times even though I made them over the course of about 5 months. Publishing is funny like that some times. I was excited to design this quilt because I was finally ready to do something with curves again. I had gotten a little burnt out on sewing them while putting my book together. There are A LOT of curves I made for that. But this was a new spin…something that I didn’t get to explore in the book: scrappy template pieces. I’m obviously not the first one in the world to do a design of multi colored circles. 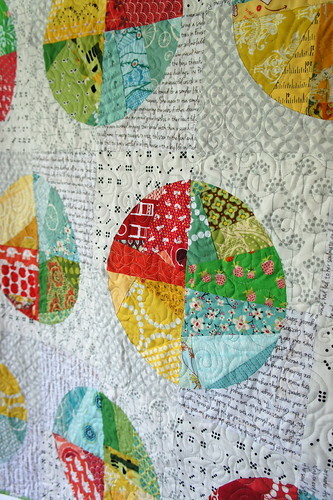 But I really love the improv piecing that I did for the inner circle part of the quarter circles. 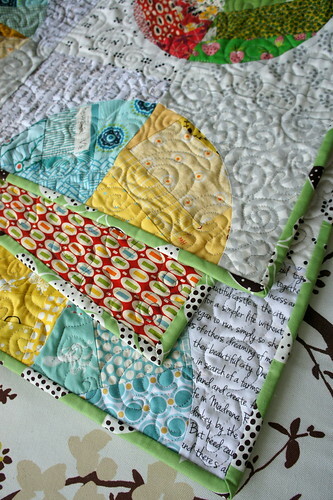 It gave me a chance to just dive into my scraps (I never even touched my regular stash for the colored sections of the quilt) and mix and match to my heart’s content. I only noticed afterwards how many fabrics I selected that had a curved motif with in the fabric. ahhh…another layer to explore in design! I made the outer template pieces in a scrappy but not pieced collection of low volume fabrics. 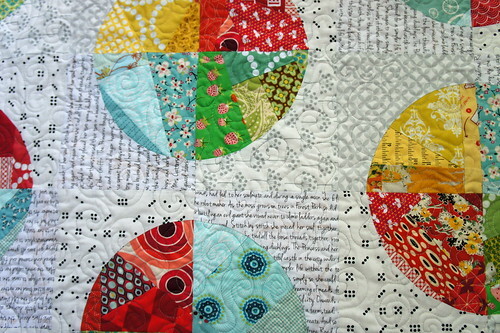 It creates depth to the pattern without drawing away from the scrappiness of the center circles. 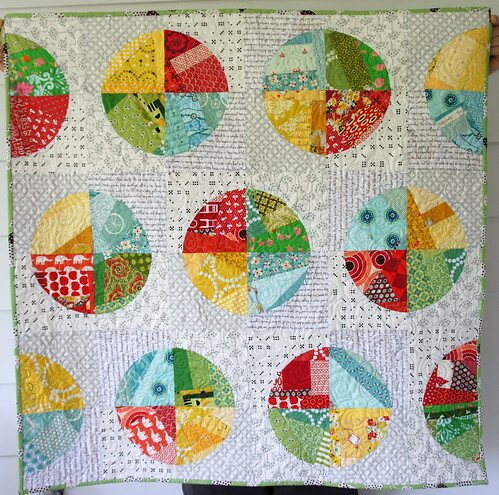 I love this quilt and it’s a very happy one for me because there are simple so many beloved scraps and fabrics that I used to make it. 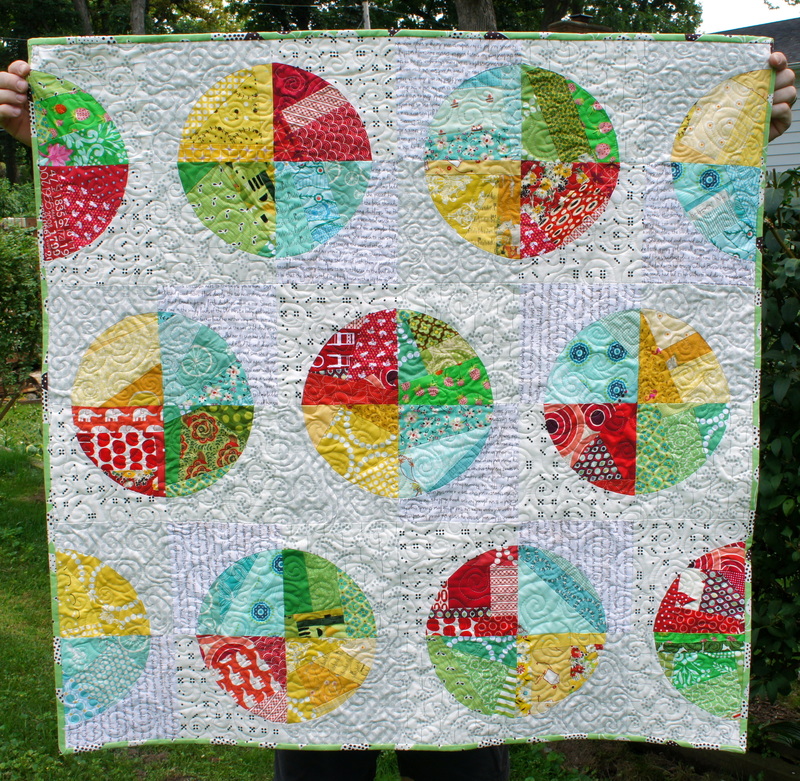 Being that it is block based, you can created a quilt as small or large as you like by simply changing the number of circles or size them. And that binding is just the perfect shade of green from an all time favorite collection, Flea Market Fancy by Denyse Schmidt. Believe it or not, this quilt has had quite the journey since it left my house earlier this year. I sent it off to England with a tad bit of trepidation about its arrival, but more about the timing of its arrival than anything. And I waited for it to arrive to Katy and be safely in her hands. And waited and waited and waited… We were able to see that the quilt did indeed make it TO England, but it had some issues when it arrived. Once it was in England, I could no longer tell where it went, but Katy had more info from the tracking end on her side. She could see that eventually it WAS delivered. But not to her. No. It had been sent hundreds of miles away and was forever simply marked as “Delivered” in the postal logs. 3 separate phone calls from Katy to her postal service amounted in no help and I had little hope that I would see the quilt again. We switched to plan B and I sent her some of the photographs that you see here in hopes that they would do for print publication. Katy never did see the quilt in person and get to style it for a shoot there. Thankfully my photos were acceptable and the quilt was able to be published in the issue. And then…one day about a week ago, I got a package in the mail. My package. Unopened and marked Return to Sender. Katy’s postal address was scratched out and it was mailed back to me. Where were you oh little quilt?! What story would you tell of your journey throughout the British Isles? it was beyond odd to have it take such a journey but certainly nothing I had control over. I had resolved myself to it being gone for forever when it showed up! 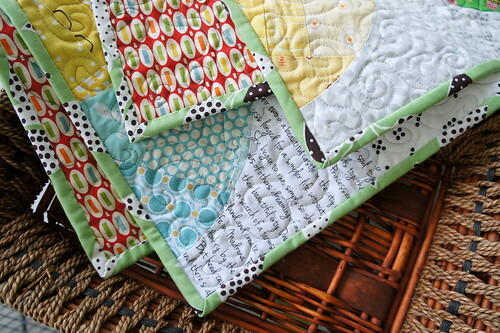 I'm so glad your quilt had a happy ending! That is so disappointing to have a lost quilt! What a fun way to use scraps! Wow!! Not only is it so cool that your fabulous quilt made her way home, but how lovely and honest of the accidental recipients to send it all of the way back. I love people! I counted 16 (or more!) pieces in each circle. WOW! Great quilt! lol! Well get the magazine and you'll see how I did it. It was really very fun. The only tricky part to that is the ironing. I really need to set up a small ironing table right by my machine for moments like that. I'm so glad your little quilt returned home after it's mystery jaunt! It would have been such a shame to lose that beauty forever. I've never done any curved piecing, but my mind keeps coming back to circular designs so I know it will be one of my next big learning curves (ha! see what I did there?). Your scrappy circles are very inspiring. Thanks for sharing this creative work! I'm glad that it finally returned to the nest at least!